The Decktet is a deck of cards with suits, ranks, and named images. It is structurally unlike ordinary poker and tarot decks, meaning that you can do different things with it. This page surveys features of the deck. The basic Decktet is a deck of 36 cards. There are six different suits (pictured on the right). Many of the games were invented by other people, and you are encouraged to experiment. Let me know if you discover anything fun! Since the cards have names and pictures, they can be used for cartomancy. I have written a bit about the structure of the deck and how it might be interpreted. The extended deck adds cards to the 36-card basic deck. For most purposes, you can start with the basic deck. Set the extra cards aside when you shuffle, just like you would with the Jokers in an ordinary pack of cards. If you want to spice up a game, you can add some or all of the extended deck cards. The extended deck is essentially a set of variants. 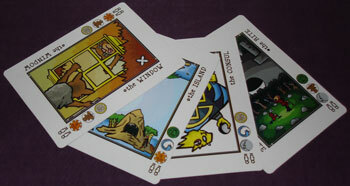 If you think of game designs as recipes for food, then using the extended deck cards is like adding cream. Adding them makes some games richer, but it just adds fat to others. And in some games, adding them just makes for a curdled mess. The Pawns are a rank of card, between 9s and Crowns. There are four Pawns. Each one has three suits, with each suit appearing on two of the four Pawns. The Courts are another rank, between Pawns and Crowns. The Decktet is ©2008-10 P.D. Magnus. Some rights reserved. The contents of this page and a version of the deck are offered as open content under a Creative Commons Attribution NonCommercial ShareAlike 3.0 License. Permissions beyond the scope of this license may be negotiated.